If you love listening to smoky jazz or just adore the aesthetics of old musical instruments, take a serious look at these iPhone speakers from artist Christopher Locke. 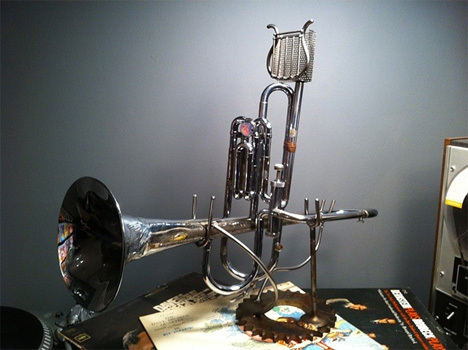 They are made from old discarded trumpets and machine parts, and they sound surprisingly good. Locke calls them “Analog Tele-Phonographer” speakers, and they use the very structure of the instrument to amplify your iPhone or iPod’s music. These extremely beautiful speakers are equal parts art and engineering. They would look perfect on the desk of a music lover and don’t use any electricity at all – though they will set you back a rather cringe-worthy $400. The juxtaposition of the classic instrument and the modern music device makes for a lovely image – and an equally lovely sound. 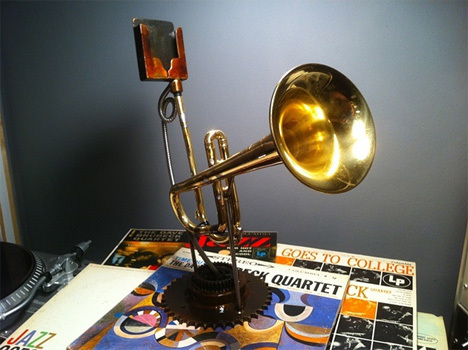 Being reincarnated as another music-making machine has got to be the ultimate dream of every unloved and unused trumpet. See more in Audio & TV or under Gadgets. April, 2011.